Description: The 311, 313, and 318 are the power for #1. The 2400's are on the dead line. 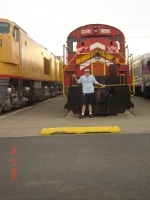 The 308 is the Norwood Yard switch engine. Description: Old photo scan: IRM's alligator waits for its turn in the restoration shop. Description: Lineup at the Illinois Railway Museum. Description: An nice Alco RSD15 Gator is on display at IRM. 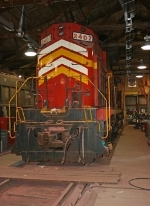 Description: Alligator RSD15 2407 stands at the Illinois Railway Museum in Union, Illinois. Description: Green Bay & Western RSD15 on Display at the Illinois Railway Museum (IRM) at Union Illinois. Description: The ever popular line-up of 4 different types of engines (FP45, Steamer, RSD15, Gas Turbine) from 4 different railways (ATSF, IC, GB&W and UP) sit at IRM. This scene may not be around for long as the museum plans to build its newest barn on this site. Description: GB&W RSD15 2407 and UP X-18 sit on display at IRM. Description: IRMs RSD-15 2407 (GBW/LS&I/ATSF) basks in glorious sunshine in from of IRMs E.Union Station. Soon to be headed for restoration in the Shop. Description: For the first time, GB&Q 2407 moves out of Barn 2 under its own power.